Dairy cows may become paralysed around the time of calving. The paralysis usually occurs in the first few days after calving, but it can occur shortly before. The disorder is called hypocalcemia or milk fever. Initially, the animal has difficulty standing and its walk is staggering. In this state, the cow can have a bad fall and become seriously injured. If left untreated, total paralysis will develop within a few hours. If the respiratory muscles and the heart muscle are also affected, the cow will die. The entire process takes less than 24 hours. Which is why farmers keep a close watch on their cows around the time of calving. If a cow in calf changes its walk, that is enough reason for concern. Cow milk contains a lot of calcium. A cow that produces a lot of milk therefore loses a lot of that mineral. It has to be supplemented through the feed. Hormones ensure a constant calcium content in the blood. It is not only a building block for bones, calcium is also required for the functioning of the muscles. In order to function properly, the blood must have a certain calcium concentration. If the concentration becomes too low, the muscles become paralysed. The same applies to the heart muscle. It is the most persevering muscle of all. But if the blood concentration becomes really too low, a cardiac arrest is inevitable. A cow with milk fever is therefore an emergency. It is evening, around milking time and I am on my way to the northern edge of our work region towards Maren-Kessel. The farms in this polder are relatively new, as the water of the river Meuse flowed here every winter until the Beerse Overlaat (overflow region) was closed in 1932. The patient is lying in the calving pasture near the cow shed. She gave birth this afternoon in the normal fashion. But just now, her walk was not as it usually was, but rather a bit unsure. The farmer suspects she has milk fever, which is why he brought her here before proceeding with milking. The grass is softer to lie down on and it will be easier for her to stand up from a grass surface than from a concrete floor. He has tied a cover around her and then he left to milk the cows. The milking machine and the cooling system of the milk tank are going at full speed when I arrive. It is very noisy, even from where I am standing. The cow is lying halfway on her side in the grass. She has not been milked, yet the udder is limp all the same. The afterbirth is in the grass behind the cow. She is cold to the touch under the cover and the thermometer indicates a low body temperature. It turns out she is a SIP-cow and so she ranks among the very best pedigreed cattle in the region. SIP stands for Stier Inseminatie Programma (bull insemination programme). It means that the artificial insemination association desires a bull calf from this cow that will serve as a future sire. And so she was inseminated with the sperm of a top-class bull. 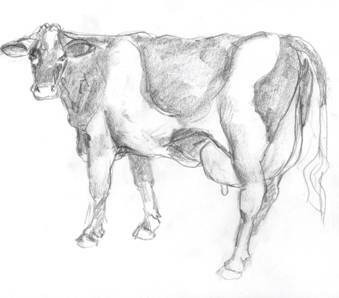 Two thick milk veins under the belly suggest that the udder can produce large amounts of milk. I insert a long drip needle into one of the veins. Using a hose, I hook up a bottle of solution containing calcium salts. I make sure that no air bubbles flow into the vein. The farmer emerges from the milking pit: “No, she didn’t fall, but her walk was strange”. His wife is meanwhile holding up the bottle with the drip. The calcium salts flow quickly into the body: half a litre in about five minutes. I listen to the heart. Because an excessive calcium concentration in the blood is dangerous as well. The heart generates an extra contraction and so the bottle is lowered to reduce the flow of the drip. The rate of flow must be adapted to that which the heart can endure and so the remaining quarter of a litre requires more time. She is then given a depot of calcium solution under the skin: it will be released later as the blood concentration reduces. This subcutaneous injection must be repeated tomorrow morning. To that end, I leave a bottle with a syringe and a few sterile needles behind. How can a cow that stores dozens of kilograms of calcium in its bones end up with a lack of calcium in its blood? And why does this occur around the time of calving? After all, the milk production does not reach its peak until after six weeks or so and it is not until then that the cow loses most of the calcium from its body. 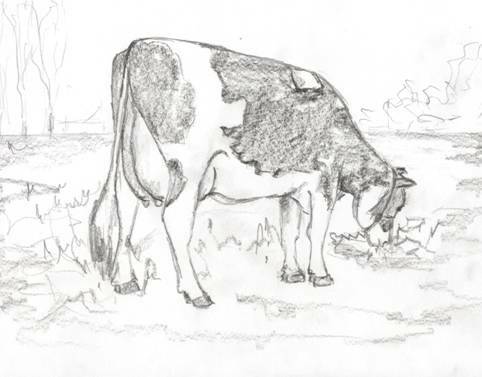 This is how I picture this to be: after a dairy cow has produced milk for a period of ten or eleven months, a non-lactating or dry period begins. The cow is no longer milked for about six weeks because it is close to calving and the ‘milk-battery’ has to be recharged for the next lactation period. The cow does not lose calcium during the dry period. This stops abruptly once the calf is born and the milk production starts again. The parathyroid glands must then suddenly produce ten to twenty times more hormone to release calcium from the bones of the cow and to keep the calcium content in the blood at the right level. And a top cow soon produces so much calcium-rich milk that its parathyroid glands experience ‘start-up problems’. As a result, the calcium concentration in the blood drops and the cow literally drops to the ground. By observing a special ration during the dry period and specially adapted feed around the time of calving, it is possible to mitigate the transition in the hormone production and to largely prevent the drop in the calcium concentration. Treating cows with milk fever is rewarding work. In some cases, completely paralysed cows on the verge of heart failure are on their feet again within fifteen minutes after being hooked up to a drip. More often, the recovery takes one to two hours, particularly if the animal has cooled down considerably. For example, if it has become paralysed but is not found until early in the morning when it is time for milking. But, with the exception of complications due to pulled muscles or broken bones after the cow has stumbled, the result of the treatment is often spectacular: there have been cases when the cow is already grazing in pasture by the time you drive off the property.